Aerocort Inhaler (Beclomethasone Dipropionate/Levosalbutamol) works by reducing inflammation and relaxing muscles in the airways, thereby improving breathing in patients with obstructive airway conditions. Aerocort Inhaler (Beclomethasone Dipropionate/Levosalbutamol) works by reducing inflammation and relaxing muscles in the airways, thereby improving breathing in patients with obstructive airway conditions. Combining 2 ingredients is considered by physicians to be ideal in the treatment of patients needing regular treatment with these ingredients, as opposed to separate administration. Beclomethasone exhibits glucocorticoid activity, and by inhibiting various different cells and mediators of inflammation that contribute to the asthmatic response, it can help prevent inflammation in the airways. Levosalbutamol is a beta 2 adrenergic receptor agonist. By relaxing the muscles in the smooth muscles of the airways, it can improve the passage of airway in and out of the lungs. 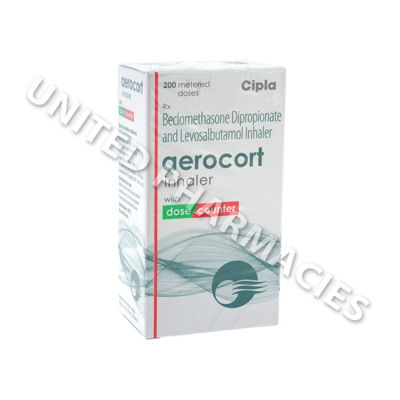 Aerocort Inhaler (Beclomethasone Dipropionate/Levosalbutamol) is provided with an inhalation device and enough medication to administer 200 metered doses. Your physician will provide precise instructions on how to use it, as well as the frequency of administration. Adult patients treating asthma are sometimes directed by their physician to administer either 2, 3 or else 4 inhalations per day (the physician will usually tell the patient to use the lowest possible effective dose). Because the exact daily dosage will vary, it is essential to listen carefully to your physician. Patients should take note of the fact that other reactions might also be experienced during treatment. If you suffer from paradoxical bronchospasms, blurred eyesight, weight loss, decreasing appetite, weak muscles or any other serious side effects which have not been referenced here, see your physician immediately. Aerocort Inhaler (Beclomethasone Dipropionate/Levosalbutamol) is not indicated for the treatment of acute asthma attacks, and instead is only used on a long term basis so as to manage the symptoms of asthma. If you experience a sudden worsening of your asthma or serious breathing difficulties, get emergency medical help straight away.